Indies Pharma Jamaica Limited (INDIES), for the year ended October 31, 2018 reported revenues for the twelve months ended October 31, 2018 of $636.17 million, an increase of 3% when compared with the $620.35 million booked last year. Cost of sales amounted to a total of $243.38 million relative to the $208.76 million reported for the same period last year, a 17% year over year increase. As such, gross profit decreased 5% or $18.80 million to a total of $392.79 million relative to the $411.59 million for the FY2017. Other operating income amounted to $813,221 a decline of 44% from last year’s $1.45 million. Administrative expenses jumped up by 7% to close the period at $239.87 million (2017: $224.87 million). This led to a dip in the company’s profit from operations from $188.17 million in 2017 to $153.74 million of this year. Notably, INDIES reported $4.48 million in foreign exchange losses for the FY2018 (2017: nil), while ‘finance cost- loan interest’ fell to $11.21 million (2017: $15.83 million). 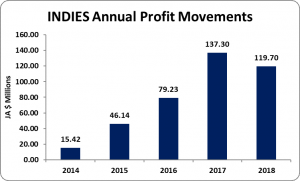 INDIES reported a profit before tax of $138.04 million relative to the $172.35 million reported in 2017. Consequently, net profit for the year amounted to $119.70 million relative to a net profit $137.30 million in 2017, after a tax charge of $18.34 million (2017: $35.04 million). Earnings per share (EPS) for the period amounted $0.09 compared to and (EPS) of $0.10 recorded in 2017. The number of shares used in the calculations is 1,332,536,649. The stock last traded on January 10, 2018 at $3.28. As at October 31, 2018, total assets amounted to $851.26 million, 3% more than $825.49 million the year prior. This was as a result of increased ‘Cash and cash equivalents’ which closed $101.39 million (2017: $74.17 million). This growth was tempered by the decline in ‘Property, plant and equipment’ and ‘Inventories’ which closed at $92.42 million (2017: $104.80 million) and $155.19 million (2017: $166.20 million) respectively. Shareholders’ Equity totalled $668.64 million (2017: $319.99 million) resulting in a book value per share of $0.50 (2017: $0.24).